Occasionally forklift drivers will break a strap, especially when they first begin implementing the Rack Safety Strap. Like the racks themselves, the rack safety straps and nets are not forklift proof. In fact, the strength of each strap is intentionally limited so that they will break before compromising the rack system itself. The big issue we see is that forklift drivers will coast into the bay allowing push-through protection devices to act as a forklift stop and alignment guide (otherwise known as banging). This is terrible for your racking, and a forklift driven this way consistently can exert multiple tons of lateral pressure on your uprights. Once a device is affixed to the rear, excessive banging in the rear equals excessive banging on the uprights, which could compromise the overall structure. When a strap fails due to an excessive load, the strap will fall from one side in a very obvious fashion. This failure notifies the driver that he is coming in a little hot and heavy and also notifies management which drivers might need a little more training. When a rack strap breaks, it can be quickly and cheaply replaced, and no damage is done to the rack system. 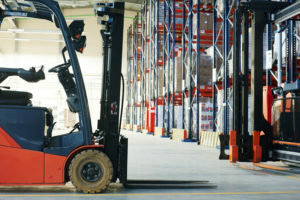 Over time, the incidence of breakage will drop significantly as forklift drivers use better alignment techniques. Each strap has a minimum burst strength of 2,400 lbs. A typical application of two to four straps increases the overall strength and spreads the forces out significantly. Could we build these differently? Sure, we could build them so that the weakest point in the system against lateral forces is the rack itself, but do you really want that?